Background Parents of children with chronic illnesses are at high risk for secondary mental health problems, such as anxiety and depression. Objective To evaluate maternal outcomes of a support intervention for families of children with selected chronic illnesses. Design A randomized controlled clinical trial design with repeated measures 1 year apart. Setting A community-based family support intervention linked to subspecialty and general pediatric clinics and practices in a metropolitan area. Participants A population-based sample of 193 mothers of children aged 7 to 11 years; the children were diagnosed as having diabetes, sickle cell anemia, cystic fibrosis, or moderate to severe asthma. About 15% of the persons contacted refused to participate in the research, and 14% of the families were lost to follow-up. Intervention The 15-month intervention, the Family-to-Family Network, was designed to enhance mothers' mental health by linking mothers of school-aged children with selected chronic illnesses with mothers of older children with the same condition. The program included telephone contacts, face-to-face visits, and special family events. Main Outcome Measures Beck Depression Inventory score and the Psychiatric Symptom Index. Results Maternal anxiety scores for participants in the experimental group decreased during the intervention period for all diagnostic groups and for the total group; scores for the control group increased (F = 5.07, P = .03). In multiple regression analyses, the intervention group was a significant predictor of posttest anxiety scores (P = .03). Effects were greater for mothers with high baseline anxiety (P<.001) and for those who were themselves in poor health (P<.01). Conclusions A family support intervention can have beneficial effects on the mental health status of mothers of children with chronic illnesses. This type of intervention can be implemented in diverse pediatric settings. BETWEEN 10 and 13 million children in the United States have a chronic health condition.1,2 Three decades of epidemiological and clinic-based studies3-5 indicate that their primary guardians, still largely their mothers, are at risk for secondary mental health problems. For clinicians, parental mental health can be critical in managing the child's medical treatment. Our program, the Family-to-Family Network, was designed to enhance (a) mothers' perceived availability of social support by linking mothers of school-aged children with selected chronic illnesses with "veteran" or "experienced" mothers whose similarly affected child has become a young adult and (b) the children's self-esteem. (Specific intervention variables and outcomes for the child are reported elsewhere.) (R.C., H.T.I., K.A.D., Y.K., unpublished data, 2000) The program integrated 2 complementary mutually reinforcing components under a standard intervention protocol. One component involved the experienced mothers, who referred to themselves as "Network Mothers" (NMs). The other component involved a child life specialist (CLS) who met and talked primarily with the child. Thus, each family in the Family-to-Family Network had a 2-person intervention team assigned for the 15-month duration of the program. In developing the program, we incorporated design elements from previous work4,9-11 and added new elements based on clinical and conceptual considerations.12 We focused on enhancing social support because of evidence linking availability of support for parents to their general well-being.13-15Social support, defined as information leading people to believe that they are esteemed and valued and that they belong to a network of mutual obligations,16 can be provided by grafting a strategically selected veteran into a mother's existing support network.17 This person can communicate support based on similarity in experience, self-disclosure, and a sense of optimism.18 In turn, this support can help families to address practical problems and manage stressors associated with raising a child with a chronic illness. The program protocol specified that, during the program period, each NM would (a) make 7 visits of 60 to 90 minutes to each assigned family, either alone or with the CLS, either in the family's home or, if the mother so requested, at nearby coffee shops; (b) have biweekly telephone contacts of at least 5 minutes to build and maintain support, follow up on issues discussed previously, or plan future meetings; and (c) participate in 3 special events, such as bowling parties or small-group lunches, that would allow program parents to meet each other in a nonstressful venue. The intervention was provided to 2 separate but overlapping cohorts from May 4, 1996, to January 31, 1999. The NMs were recruited by asking directors and staff of specialty clinics to nominate potentially suitable mothers whose affected child was aged 18 years or older. A total of 106 women were nominated. Of these, 39 joined our 30-hour training program, for which they were paid at an hourly rate. This training focused on enhancing skills in listening, reflecting, and "story swapping." Role plays, videotaped interviews, and in-class practice interviews were used. We invited successful "graduates" of the training program to participate in the Family-to-Family Network as NMs. These persons then underwent an additional 20 hours of training along with the CLS to reinforce the team aspects of the program and to review operational procedures. Overall, 18 women worked as NMs for the Family-to-Family Network. Each NM had from 1 to 7 assigned families and was paid hourly for all program-related efforts. Three CLSs were employed in half-time positions. Team assignments to enrolled parents were made based on diagnosis (parents with children who had the same condition were linked) and, to the extent possible, geographic proximity. After assignments were made, the NMs contacted the parents and the program began. The NMs and CLSs all met together weekly with a pediatrician (R.C.) and a social worker to ensure that the intervention was being delivered as planned to the greatest extent possible. These meetings served to coordinate efforts within and across teams, address ongoing problems, and review issues related to recent or upcoming contacts or special events. The NMs and the CLSs coordinated their efforts with each family and were in regular telephone contact to exchange information from individual visits and telephone calls. Additional program details can be found in a manual available from one of us (H.T.I.). The objective of the intervention was to decrease maternal risk for symptoms of anxiety and depression. The NMs were trained to provide 3 specific types of support.19-21 Informational support was provided by linking families with existing health and community resources and by sharing information among mothers about child behavior, parenting, and coping; this type of support was enhanced when the NM acted as a link to put mothers in contact with existing services (eg, housing or educational assistance). The NM provided affirmational support by enhancing a mother's confidence in parenting and by reassuring her that her concerns and issues were appropriate. Specifically, the NM identified the mother's special competencies and provided feedback about those skills that contribute to positive self-evaluation. The NM also provided emotional support by being available to listen to a parent's concerns, demonstrating a continued interest in the mother's viewpoints and experiences, and effectively communicating an understanding of the mother's feelings and concerns. Throughout the intervention, the NM aimed to (1) identify naturally occurring sources of support, (2) point out examples of effective parenting by the mother, and (3) discuss opportunities for strengthening these sources of support and existing parenting skills. All parent-related program activities were guided by concepts drawn from 4 areas (social support concepts, theories of reactions to offers of aid, concepts of empowerment, and social comparison processes) and by specific assumptions about phases in relationships between the NMs and their assigned parents (introduction, rapport building, maintaining contact, and termination). Our manual provides additional information about the program's conceptual framework. The program offered to the control group was designed to reflect a common clinical practice in many subspecialty clinics, where the physician gives a mother the name of another parent to call should she need support or information. The mothers randomly assigned to our control group were given a telephone number through which they could reach an experienced parent if they so wanted. This experienced parent did not go through any training and did not initiate telephone calls. Conceptually, this procedure yields a low-dose control group. Less than 3% of mothers (n = 2) assigned to the control group called this number. After potential participants were identified, a letter was sent by the clinic director or pediatrician to the families describing longitudinal research involving families of children with chronic illness, inviting them to participate if they wanted, and noting that someone would call them to explain the project in detail. The letter stressed that participation was voluntary. If families agreed to participate during the follow-up telephone call, appointments were made for interviewers to come to the family's home (or to meet at the clinic if the parent so desired) for the interviews. Data were collected by 45- to 90-minute, face-to-face, structured interviews at baseline and at 12 months postbaseline and by 15- to 20-minute telephone interviews at 4, 8, and 16 months postbaseline. At each face-to-face interview, mothers were paid $20 for their time. Mothers received $15 after completing the set of telephone interviews. Interviews were completed by paid interviewers who had undergone extensive training and were blind to group assignment. Posttest questions pertaining to group assignment (eg, questions about the relationship with the NM) were asked only after all other parts of the interview were complete. Each completed interview was reviewed by one of us (H.T.I. or K.A.D.) to identify interviewer error or need for follow-up. Informed consent statements pertaining to the research project were signed at the initial interview. All procedures were approved by relevant institutional review boards. Families who agreed to be randomized (who put their names in the hat) were randomly assigned by a project investigator (K.A.D.) to experimental or control groups within clinics using blocks of 4 cells (eg, experimental-control-control-experimental or control-experimental-control-experimental). This method ensured that an approximately equal number of families from each clinic would be assigned to the experimental and control conditions. Mothers were sent letters informing them of their group assignment and, if appropriate, the name of their NM and CLS. Network Mother-CLS teams were informed of assignments at their weekly meetings. As Figure 1 illustrates, 565 letters were sent to patients, inviting them to participate in the study. One hundred seventy-four (31%) were unable to be contacted and 115 (20%) were ineligible (outside the geographic area, mental retardation, language difficulties, or asthma severity criteria). Fifty-seven (10%) refused to participate and 26 (5%) were unable to be scheduled for an interview within the interview period. One hundred ninety-three interviews were completed. Study design. T1 indicates baseline; T2, 12 months postbaseline. Of the 193 mothers who were eligible for randomization at baseline, 32 (17%) refused to be randomized. These mothers, compared with their counterparts who agreed to participate in one of the programs, reported more confidence, more support, and less depression.23 Other differences between the refused randomization group and the experimental and the control groups are described in detail elsewhere.23 For this report, we excluded data from mothers who refused to be randomized. These data were excluded because we undertook an intent-to-treat analysis of program effects. There was no intention to treat this subgroup because they declined the opportunity to be randomized to either program; thus, they represent a subgroup of persons who would not be exposed to the intervention by their own choice. Excluding this subgroup accomplishes 2 purposes. First, the remaining sample approximates more accurately the population that would participate in the program if it were implemented widely. Second, it allows for a fairer test of intervention effects because these effects will not be diluted by persons disinterested in participating. Of the remaining 161 families, 86 were randomly assigned to the experimental group and 75 to the control group. No differences on demographic, condition-related, or mental health variables were found between the experimental and the control groups at baseline. A total of 22 families were lost to follow-up, with no difference in attrition between experimental (13 families [15%]) and control (9 families [12%]) groups. Compared with families who completed interviews 12 months postbaseline, families lost to follow-up were more likely to be on welfare; no other statistically significant differences were found. For evaluating program effects, we used data from 139 mothers. Diagnostic and selected demographic characteristics of this sample are shown in Table 1. The structured questionnaire included items used in previous studies4,9,10 to collect demographic data and information related to the child's diagnosis, health status, and functioning. Maternal physical health was assessed with the following item: "Compared to other people your age, would you say that your health is excellent, very good, good, fair, or poor?" For some analyses, we dichotomized this variable to define 2 groups: those who said that their health was excellent or very good and those who said that their health was good, fair, or poor. Maternal anxiety was measured by the 11-item anxiety subscale of the Psychiatric Symptom Index (PSI).24 The PSI has been used in several similar studies.4,9,10 One of its subscales pertains to anxiety. α Coefficients for the 11-item anxiety subscale have ranged from .85 to .91.9,24 Psychiatric Symptom Index subscale scores are standardized; their possible range is from 0 to 100. Maternal depression was assessed by the 21-item Beck Depression Inventory.25 Each item describes a specific behavioral manifestation of depression and consists of a graded series of evaluative statements ranked from neutral to maximum severity. Studies26 have yielded split-half reliability coefficients of 0.86 and validity estimates ranging from 0.59 to 0.68. We measured "dose" of intervention in 2 ways: number of contact minutes between families and their intervention team and overall ratings by the CLSs of the extent to which families were involved in the program. First, using t tests, we examined whether the experimental and control groups were comparable at baseline to check the results of randomization. Second, using analyses of variance, we examined whether maternal mental health outcomes varied by intervention group and baseline maternal characteristics (eg, baseline anxiety level or their own physical health status). Third, we assessed the effect of the intervention on anxiety and depression using multiple regression models. We used stepwise multivariate analyses, first with selected covariates measured at baseline (including baseline anxiety scores) and then with selected interactions. Table 2 shows baseline and postintervention mean scores on the PSI anxiety subscale for the experimental and control groups by diagnosis and for the total sample. These data indicate that participants in the experimental group reported lower levels of anxiety postintervention compared with baseline scores; mean anxiety scores decreased in each diagnostic group. In contrast, participants in the control group reported higher levels of anxiety 1 year after baseline; increases occurred across all diagnostic groups. Analyses of variance indicated that the intervention had a significant main effect (F = 5.07, P = .03). Bivariate analyses suggested that the intervention's effect was especially pronounced for mothers who were highly anxious at baseline. Figure 2 illustrates this finding. We compared the decrease in anxiety scores between experimental group and control group mothers whose anxiety scores were above the overall group mean at baseline (which is equivalent to the mean anxiety score plus 1 SD in the normative sample).24 Mean anxiety scores for the highly anxious experimental group mothers decreased from 33.3 at baseline to 26.4 at 12 months postbaseline; mean scores for the highly anxious control group mothers remained unchanged during this period (31.9 vs 31.6). Mean anxiety scores for the low-anxiety experimental group mothers increased slightly from 10.5 at baseline to 11.1 at 12 months postbaseline; in contrast, mean scores for the low-anxiety control group mothers increased substantially from 9.9 to 14.1 during this period. This pattern cannot be explained by overall regression to the mean because of the differential effects across the groups. Effects of the intervention on posttest anxiety by maternal baseline anxiety (A) and physical health status (B). PSI indicates Psychiatric Symptom Index; E, experimental; T1, baseline; and C, control. Maternal physical health at baseline also was an important factor in determining effects of the intervention, as Figure 2 illustrates. The mean anxiety score for experimental group mothers who reported that they were in good, fair, or poor health at baseline decreased from 26.4 to 23.9 during the intervention period; in contrast, the mean anxiety score for the control group mothers who reported being in good, fair, or poor health at baseline increased from 24.8 (baseline) to 26.5 (12 months postbaseline). Experimental group mothers who said that they were in very good or excellent health also showed a decrease in anxiety (from 13.4 to 11.5); in contrast, control group mothers in very good or excellent health reported an increase in anxiety during this period (from 15.2 to 17.9). Results of multivariate analyses of these main and interaction effects on PSI anxiety scores are shown in Table 3. In step 1, we introduced only the intervention group variable and found that its effect on anxiety scores was marginally significant. After controlling for baseline anxiety, however, the effect of the intervention group became significant, as indicated in step 2. This result suggests that the intervention was successful in reducing anxiety in those who were assigned to the experimental group. We also examined the effects of the interactions illustrated in Figure 2, as shown in the third step of our multivariate analysis. Both interactions have significant effects. In these analyses, baseline anxiety was entered as a continuous variable. Maternal health also has a main effect, indicating that mothers who reported that they were in good, fair, or poor health benefited particularly from the intervention. The intervention had no demonstrable effect on symptoms of depression, as reported on the Beck Depression Inventory, possibly because mothers in the sample reported unexpectedly low levels of depressive symptoms compared with other studies of this population using the same or similar instruments. It is unclear why depressive symptoms are low in this sample. We found no support for differential effects depending on the number of stressful life events as reported by the mother and no support for a dose-response relationship. Our results demonstrate the effectiveness of a family support intervention in reducing symptoms of anxiety in mothers of children with selected chronic health conditions. The intervention had a similar effect across diagnostic groups, suggesting that it could be effective for mothers of children with other chronic illnesses. The intervention may be especially salient for mothers who are anxious or who themselves are in poor health. Several features of this study enhance confidence in its results. First, the randomized trial design is a rigorous method for program evaluation. Second, excluding nonjoiners from an intent-to-treat analysis avoids dilution of program effects. Third, the program was implemented in a disease-specific manner while the evaluation was conducted at a generic level, thus increasing the power to detect true differences without diminishing clinical relevance. Fourth, the control group was designed to reflect practices in many sites. Finally, we randomized within recruitment site to avoid potential site-specific biases. Our findings are consistent with other evaluations of similar interventions for mothers of children with chronic illnesses. In a sample of 343 inner-city mothers of children with a wider range of chronic illnesses, Silver and colleagues4 reported a decrease in experimental group PSI anxiety scores from 21.4 to 19.4; the control group showed no change (scores decreased from 17.6 to 17.3). In a sample of 42 mothers of children with arthritis, Ireys and colleagues9 reported a decrease in experimental group PSI anxiety scores from 16.9 to 11.6; the control group showed no change (scores increased from 15.3 to 15.6). In neither study were the changes statistically significant. However, these 2 studies combined with the study reported herein provide compelling evidence that family support interventions do have positive effects on maternal anxiety. Does a mean change of 2 to 3 points on the PSI anxiety subscale have clinical significance? In effect, this change means that most mothers in the experimental group reported some reduction in frequency of feelings related to anxiety. The normative score for the anxiety subscale, as reported by Ilfeld,24 is 7. Although these normative data are somewhat old, they suggest that most mothers in our sample and in similar samples from prior studies have more frequent feelings of anxiety than do the population as a whole. However, no clinical cut points have been established for the PSI and none of the mothers reported that they had been diagnosed as having an anxiety disorder. It is our clinical impression that mothers of children with chronic conditions spend a great deal of time worrying about their children's health and the quality of their children's health care services. It is quite plausible that this worry translates into more than occasional feelings of "having an upset stomach," "feeling tense or keyed up," or "feeling nervous or shaky inside," all of which are items included on the PSI. If our intervention has reduced the frequency of these feelings for most of the mothers in our high-risk but not clinically diagnosable sample, then we believe the intervention has had meaningful effects. We anticipated that the intervention would decrease symptoms of maternal depression, but found no evidence for this effect. One reason for this result may be the relatively low baseline level of depressive symptoms reported by this sample of mothers, which would have been difficult to reduce further with any kind of support program. In addition, our sample may not have included mothers with elevated levels of depressive symptoms if these mothers selectively excluded themselves from the study. The possibility of selection bias in trials of community-based interventions with high-risk families should be explored more fully in future studies. The study has several limitations. Despite extensive recruitment efforts, our sample may not be representative of the broader population of families of children with chronic health problems. Resources unfortunately precluded assessment of the mental health of fathers, an important dimension for inclusion in future studies. We also are unable to determine mechanisms of effects. For example, measurement of available resources (eg, social support) was limited to a few items; as a result, we may have missed measuring critical pathways by which the intervention had its effect. Finally, in the medical world of the early 21st century, success is often measured by reduction in use or cost of services. Using this metric, our intervention remains untested. This study underscores the value of family support programs for parents of children with special health care needs. In the more than 10 million American families who have a child with a chronic health condition, there are many parents who are worried about their children's well-being.5,28,29 Most parents of these children are well aware of the profound effects that chronic and disabling conditions can have on quality of life. As a result, many of these parents bring their worries to the attention of their physicians. The availability of a well-designed family-to-family support program offers physicians and other clinicians a referral that promises to have important psychological benefits for mothers. Epidemiological and clinic-based studies indicate that mothers of children with chronic illnesses are at risk for secondary mental health problems. Despite this finding, few theory-driven interventions to reduce this risk have been implemented and evaluated with methodologically strong designs. 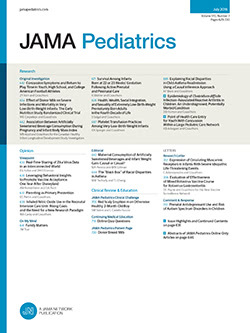 In this report, we present parent outcomes of a randomized controlled clinical trial of a 15-month, community-based, family support intervention for school-aged children with 1 of 4 chronic illnesses (diabetes, sickle cell anemia, cystic fibrosis, or moderate to severe asthma) and their mothers. Our results demonstrate that the intervention reduced mothers' symptoms of anxiety. The availability of a well-designed family-to-family support program offers pediatricians a referral that promises to have important psychological benefits for mothers. Accepted for publication January 22, 2001. This study was supported by grant MCJ-240804 from the Maternal and Child Health Bureau, US Department of Health and Human Services, Rockville, Md. We thank the pediatricians, project interviewers, and families who graciously participated in this effort; Miye Schakne, Beverly B. Walsh, PhD, Ruth E. K. Stein, MD, Susan Radius, PhD, Laurie Bauman, PhD, and the program's 3 child life specialists, Erin Munn, Marcy Widener, and Gina Fortunato, who are pioneers in their field; and the Network Mothers for their commitment, caring, and enthusiasm, which made the program work. Corresponding author and reprints: Henry T. Ireys, PhD, Mathematica Policy Research, Inc, 600 Maryland Ave SW, Suite 550, Washington, DC 20024-2512 (e-mail: hlreys@mathematica-mpr.com).